It is the first instance of an epistemological alternative to God’s design. Satan offers to Eve a different way to have God-like knowledge. Satan argues that God is actually deceiving Eve into ignorance by keeping her from the tree of the knowledge of good and evil. Satan’s plan was both clear and appealing: Be like God by the assertion of your own will, and be free from God’s restrictive design. Declare your independence from God by doing it your own way—the result will be the same. Satan’s temptation of Eve is also the first instance of a hermeneutic alternative to God’s design. Satan’s temptation of Eve was the first recorded instance of a non-literal interpretation of God’s word. Satan asks Eve, “Has God said … ?” and then proceeds to distort what God had actually said (3:1). In contrast, Genesis 1-12 represents roughly 2,500 years of history, and during that time, of the roughly 31 references to God speaking, this is the only instance (besides Eve’s fumbling in response to Satan’s challenge) in which God’s word isn’t taken at face value. Read more about No Hell? What is the Biblical Perspective on “Natural Disasters”? Earlier this year, the massive loss of life and utter devastation to property that afflicted northern Japan as a consequence of a massive earthquake and tsunami were appalling by their massiveness. In subsequent weeks and months, a series of property-destroying and death-dealing tornadoes repeatedly afflicted the heartland of America, most recently in Joplin, Missouri. While the death and destruction in Japan were much more extensive than all the storms collectively in America, the much closer proximity of these American storms to us in south central Kansas, particularly the tornado in Joplin (a city just three-plus hours away by car , and one we have driven through dozens of times), gives them a much greater immediacy. What did happen there could easily happen here. The prominence of such tragedies in recent news raises a serious question: Why? What cause was behind these disasters? Can a direct line from cause to effect be traced? 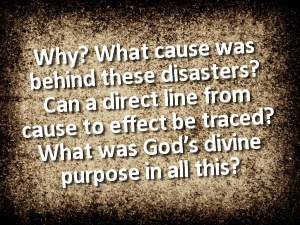 What was God’s divine purpose in all this? The first and natural (and usually wrong) impulse is to say, “It must have been deserved. Something these people did brought this on themselves.” That was the theory of Job’s friends in trying to reason through the cause of his multiplied calamities. That was the speculation of Jesus’ disciples, too, when they saw the man born blind in John 9. Surely his parents or he himself committed some specific sin (which in the case of the man himself assumes divine foreknowledge of a future heinous sin and a preemptive strike, of sorts, by God).